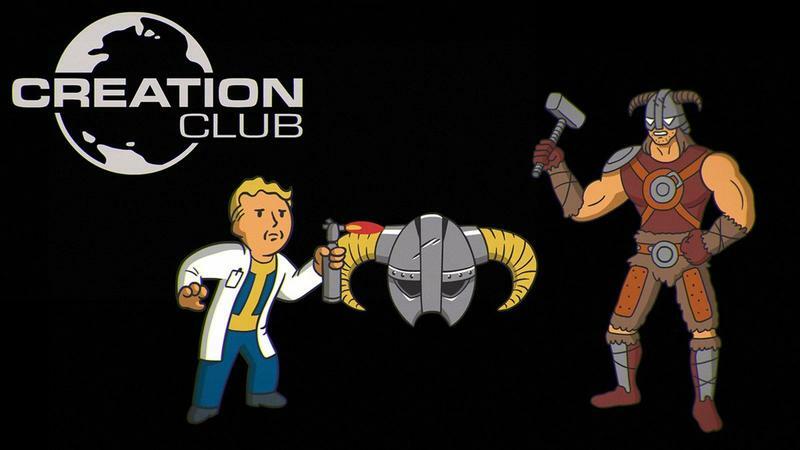 One of the biggest moments of Bethesda's E3 2017 press conference wasn't the introduction of a video game, but rather, the introduction of a new, officially backed mod community, Creation Club. It's a simple name for an idea that stumbles into a very complex issue in the gaming world, one in which the creators of mods have the option of making money off of their creations. The system is pretty easy. As a gamer, you pick up credits through Steam, PlayStation Plus, or Xbox Live, and then you spend those credits on the mods you want to buy on the Creation Club's storefront page. It's pretty much the exact same thing as the online retailers themselves, just for user created content. The issue is a flashpoint in the PC world. Two years ago, Steam and Bethesda teamed up to give the idea an early start, but the mod scene ripped itself apart overnight. It wasn't pretty. Longtime benefactors of mods, the gamers, claim that modding is a community and should only be done as a hobby. However, those who sink countless hours into making the mods, or in other words, doing all the work, thought they finally found an opportunity to make a few dollars off their hobby and could put more time and focus into it. You can see where the contention lies. Gamers don't want to pay for mods and want to enjoy free extra content until the cows come home, and the modders think they are entitled to a little something for their hard work. Creation Club could possibly restart that debate all over again, but Bethesda's own words state that this is not "paid mods" on the official website. No. Mods will remain a free and open system where anyone can create and share what they'd like. Also, we won't allow any existing mods to be retrofitted into Creation Club, it must all be original content. Most of the Creation Club content is created internally, some with external partners who have worked on our games, and some by external Creators. All the content is approved, curated, and taken through the full internal dev cycle; including localization, polishing, and testing. This also guarantees that all content works together. We've looked at many ways to do "paid mods", and the problems outweigh the benefits. We've encountered many of those issues before. But, there's a constant demand from our fans to add more official high quality content to our games, and while we are able to create a lot of it, we think many in our community have the talent to work directly with us and create some amazing new things. The argument is that not all mods will be charged for, but if there is an especially high-quality one that had a lot of man-hours sunk into it, then yes, you might need to compensate the creator. "Mods" will remain free, the "content" from creators on Creation Club will not. In other words, you'll have to start distinguishing the two. I have no horse in this race. I don't use mods, and I don't make mods. I don't think it's entirely unreasonable if a person who sinks many hundreds of hours into creating gaming content gets a little money for their hard labor. I do believe it's a little unreasonable for gamers to say you have to do this for free or don't do this at all. The idea of Creation Club will grant an extra layer of protection since these modders will now have an official title of "Creator" and the backing of Bethesda. Don't expect this to be the last we hear of this argument.